But as you can see in the picture, it really isn't so bad. 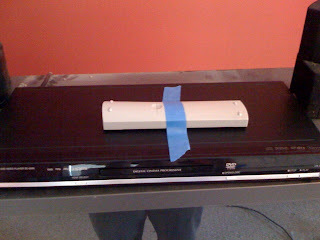 We held on to our small TV/DVD combo unit, our Direct TV DVR reciever, and our Wii. All that stuff is sitting on a lightweight aluminum camping table. 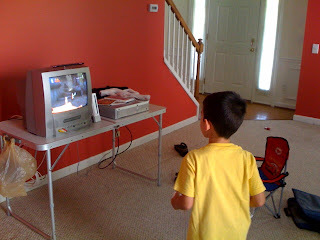 This week we let Jake buy Lego Star Wars, The Complete Saga for Wii and he's really been enjoying it. You can also see the small camping chair next to Jacob...that's Timmy's. I'm very glad the boys didn't see this! Throw everything you DON'T want the packers to move into one room, close/lock/put a tape "X" over the door and make it the "Do Not Pack" room. 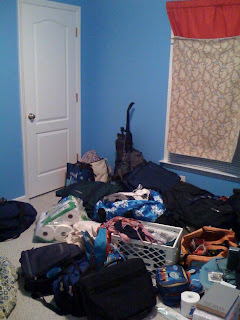 In this case, you're looking at Timmy's room, emptied of his belongings. Pardon the mess, today we were trying to keep one step ahead of the packers, coming up with additional things that we needed to stash in that room. Once the movers are through, we will redistribute what's in this room a little better. We're staying in our house for 9 days until closing...then we'll stay in a hotel for 4 days. By the way, everything in this room has to fit into our Odyssey, Prius, and the car top carriers for both vehicles...plus space for the boys and the dog. I have a U-Haul small trailer reserved just in case we're WAY overboard, but I don't think we will be. PS: Ever heard of Freecycle? It's my new best friend for getting rid of stuff without having to load it all into the car. I've signed up for both Wake County, NC's and Sarpy County, NE's. This past weekend someone Freecycled a new X-Box!!!! I'll be offering up a lot of stuff once the movers are done here. Some of it is on Craig's List right now, but not going anywhere. I couldn't be more proud -- it's an amazing accomplishment! I love you! I have been sitting on this for long enough. My poor brain kept prioritizing things all wrong, so now it's getting sorted out. I need to pass on the Excellent Blog Award before I pack up this laptop tomorrow, since the ExcellentBlog.jpg file is on this hard drive. Tee hee. I had actually decided on this Memorial Day weekend, when this individual posted 7 times on Memorial Day alone! Fotomom, you're getting the Excellent Blog award! Your fun mix of watching your boys grow up with your beautiful photos of flowers, animals, and the ever-shrinking central North Carolina countryside is most awesome. Keep up the great work, I'll definitely need you to when I'm in NE and it's the only way I'm going to see Joey and Johnny (sniff sniff). As of 1800 Sunday, July 6th, 2008, we have to bid farewell to the KNCAPEX18 Weather Station site on Wunderground.com. The packers start tomorrow and the weather station needs to come with us to Nebraska. Stay tuned for our weather station's new location in Bellevue, NE sometime the first week of August. Isn't the Point of a Vacation to Rest and Be Ready to Work Again? But after a weekend like this one, it'll be hard to plunge back into move-preparations! The packers are coming in 24 hours! We had a wonderful time with friends who we'll miss when we move. The Kapla blocks. I could not peel Dave away from this...Jake's participating in a building contest here, whoever made the tallest structure in 10 minutes won a prize. Jake didn't win. After the contest, Timmy continued his structure all by himself -- the one on the left. The one on the right is mine.